We’ve shared why peptides are important for skin and how they work, but equally interesting are amino acids. Amino acids are the building blocks of both peptides and proteins, and each has a specific role in skincare. Amino acids maintain skin’s hydration, texture, resilience, and an overall supple, healthy appearance. It’s not a stretch to say that amino acids are indispensable, for our skin and elsewhere in our body. That’s why we chose several amino acids to play a supporting role in our skin-firming Peptide Booster as well as in other skincare products. There are many amino acids, but most scientists agree that there are 20 that are important to our health, divided into two types: essential and non-essential. The “non-essential” term doesn’t mean that those amino acids aren’t important; rather, it means that your body can make them on its own, so it’s not “essential” for you to get them elsewhere, such as from food or supplements. “Essential” amino acids, on the other hand, are essential because they must be obtained from foods or supplements; a deficiency in even one of them can result in health problems. There are nine essential amino acids: histidine, isoleucine, leucine, lysine, methionine, phenylalanine, threonine, tryptophan, and valine. The best food sources of these amino acids include animal protein (seafood, beef, poultry), followed by animal by-products such as eggs and dairy. Vegan sources of essential amino acids include quinoa and soy/tofu. Beans and nuts also provide some amino acids, but not all of the essentials. The 11 non-essential amino acids, which the body can make on its own, include alanine, arginine, asparagine, aspartic acid, cysteine, glutamic acid, glutamine, glycine, proline, serine, and tyrosine. Several of these are also known as “conditional” amino acids, meaning they’re made by the body, but only under certain conditions, such as when we're under stress or ill.
Each amino acid plays a vital role in maintaining our health as well as the appearance of our skin. But, just how do amino acids work on and within skin? Amino acids are naturally present in skin, as part of what’s called our natural moisturising factors (NMFs). Within skin’s uppermost layers, amino acids work as conductors, orchestrating an incredibly complex “concert” that allows our skin to thrive and to stay hydrated. One of the ways they do this is by working in harmony with aquaporins (the body’s water transport system) to move moisture throughout skin. Because of this, the primary benefit is that the amino acids help maintain skin’s smoothness and hydration, something they also do when applied via skincare products. 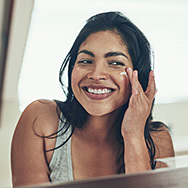 There also are more surprising benefits of these small, but potent, skincare heroes: Some amino acids work as antioxidants; however, most of them are believed to play an even greater role by helping skin create more of its own antioxidants, such as glutathione. Topically applied amino acids help strengthen skin’s natural defense system, making it less likely to show signs of ageing from environmental damage. Interestingly, research has shown that synthetic amino acids often have greater hydrating ability than animal- or plant-derived amino acids. Because many amino acids are animal-derived, this is encouraging news if you prefer to avoid such ingredients, as we do. Arginine plays a role in repairing visible skin damage. Histidine has antioxidant ability and can soothe skin. Methionine neutralises damaging substances before they can harm skin. Lysine helps visibly firm skin’s surface by reinforcing its supportive elements. Proline, leucine, and glycine diminish the look of fine lines and wrinkles. All amino acids included in skincare products work in combination with other ingredients that are also part of skin’s NMFs, including our favourites glycerin, ceramides, various peptides, and hyaluronic acid. The amino acids work particularly well with peptides—that’s why we include them in our Peptide Booster, a targeted product that significantly increases skin’s hydration as it reduces signs of ageing. Amino acids are truly versatile ingredients that complement other beneficial skincare ingredients, from antioxidants to plant extracts to omega fatty acids. Without question, topically applied amino acids improve all skin types, and can benefit all ages, especially if your goal is to prevent or diminish signs of ageing.